New Delhi : Wholesale solar power prices have reached another record low in India, faster than analysts predicted and further undercutting the price of fossil fuel-generated power in the country. The tumbling price of solar energy also increases the likelihood that India will meet – and by its own predictions, exceed – the renewable energy targets it set at the Paris climate accords in December 2015. India is the world’s third-largest carbon polluter, with emissions forecast to at least double as it seeks to develop its economy and lift hundreds of millions of citizens out of poverty. At a reverse auction in Rajasthan on Tuesday, power companies Phelan Energy and Avaada Power each offered to charge 2.62 rupees per kilowatt-hour (kWh) of electricity generated from solar panels they hope to build at an energy park in the desert state. Last year’s previous record lowest bid was 4.34 rupees per kWh . Analysts called the 40% price drop “world historic” and said it was driven by cheaper finance and growing investor confidence in India’s pledge to dramatically increase its renewable energy capacity. It reduces the market price of solar tariffs well past the average charged by India’s largest thermal coal conglomerate, currently around 3.20 rupees per kWh . Wholesale price bids for wind energy also reached a record low of 3.46 rupees in February. Kanika Chawla, a senior programme lead at the Delhi-based Council for Energy, Environment and Water (CEEW), said it was encouraging that Rajasthan project bidders were “new players, not the same old market leaders”. “It shows there is enough happening to attract investment, attract interest from companies who have otherwise been cautious,” she said. Prices were likely to drop further if the cost of borrowing money continued to fall – which she said was one of the major drivers in the record low prices this year. “Any future incremental gains in prices will not come from the decline in technology prices, they will come from declines in the cost of finance,” she said. Investors were also likely encouraged by a recent move to allow the state-backed Solar Energy Corporation of India to act as a guarantor in agreements between energy developers and India’s debt-ridden power distribution companies. Tim Buckley, a director at the Institute for Energy Economics and Financial Analysis, said the most important factor driving a rush of international investment in Indian renewables was the “transparency, longevity and certainty” of the country’s energy policy. “That is absolutely critical because when you invest for 25 to 35 years, you need certainty and clarity of policy,” he said. “India has prime minister [Narendra] Modi saying this is his number one objective, you have energy minister [Piyush] Goyal talking about it every day. There is no doubt in anyone’s mind about Goyal’s commitment to this program and Modi’s endorsement of what Goyal’s doing,” he said. 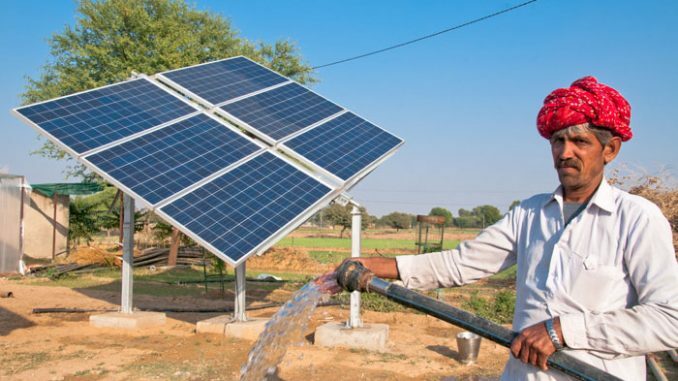 By 2022, India aims to have the capacity to generate 175 gigawatts of power from solar, biomass and wind energy. A draft report by the country’s electricity agency in December predicted that capacity would increase to 275 gigawatts by 2027. Chawla said the successive drops in renewable prices “should be celebrated” but cautioned that systemic reforms were still needed to make the trend sustainable. Renewable energy projects also still enjoyed exemptions from some taxes that fossil fuel-generators had to pay, she added. “We need to run the numbers before we can say [unsubsidised solar] is cheaper than coal, but it’s definitely competitive,” she said.